The rate of meth use among Native Americans is the highest of any ethnicity in the country and more than twice as high as any other group, according to the National Congress of American Indians. This issue not only affects those abusing the drug, but also causes a ripple effect within the entire community. 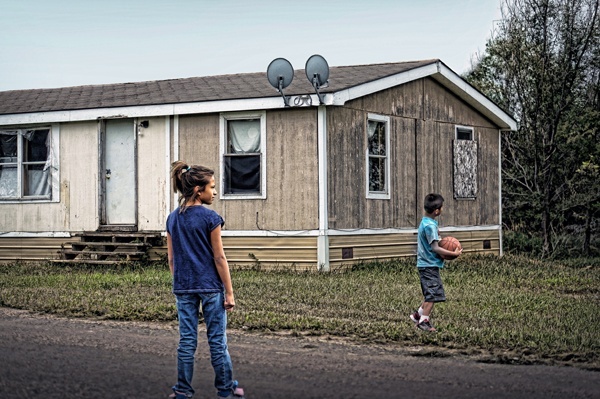 Right now, for example, there are 86 families on the Crow Creek Reservation in South Dakota without a home. On this same reservation are 16 homes contaminated by meth that now sit empty and boarded up, awaiting funding and renovations to make the home livable. Zane and his family are currently homeless and are shuffled between family members and friends in order to survive. Harsh South Dakota winters present even more challenges for the homeless like Zane. This young Native American father shares, "When I don't have a place to stay, I feel like there is no hope and no reason to keep moving on." One tribal member shares, "We need to put an end to this now. Our children are the future of our people. We can't have them growing up in an environment like this. Who will take care of all of us when we are older if they don't grow up healthy and with a strong mind?" • South Dakota Attorney General Marty Jackley proclaimed that South Dakota is under a methamphetamine epidemic. • The Department of Justice has reported that Native Americans have the highest rates of meth abuse in the nation. But there is hope! This holiday season, we are partnering with the Crow Creek Tribal Housing Authority to renovate these homes and provide housing for homeless Native families. Our goal is to repair three condemned homes on the Crow Creek Reservation that stand empty due to meth use in the homes. The families contributing to the contamination have been displaced, and the 86 families who need a home, like Zane's family, are on the waiting list—waiting for the funding for these homes to be repaired. Each family waiting completes an application and background check and waits for a home, free of meth. You can help fight the devastation of meth in Native communities by giving the homeless homes for the holidays!